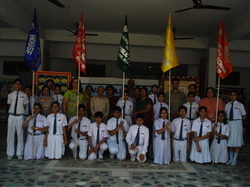 The Investiture Ceremony of the Student’s Council of DAV Public School, Khera Khurd was held on 29th April 2011. 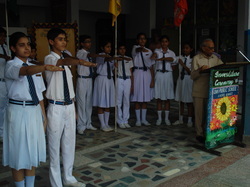 The members of the new Student’s Council were decorated with badges and administered the pledge by Chairman of the school Sh. Baldev Jindal. The Head Boy-Shivankar Tyagi and Head Girl-Amisha Vashishth along with the newly appointed House Captains promised to uphold the school’s tradition, abide by the school rules and perform their duties sincerely. Principal Ms. Monika Mehan congratulated the newly appointed members and advised them to be ideal role models for the students and responsible torch-bearers who would take the country towards a better tomorrow.